Due to radiation fears, the FDA has banned milk, milk products, and fresh vegetables and fruit from the four prefectures near the Fukushima Daiichi nuclear power plant from entering the United Stats. Other food from the area will be tested before being allowed into the country. 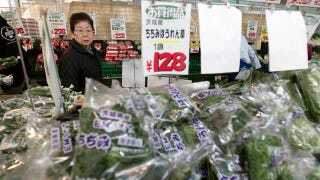 Japan's Prime Miniser Naoto Kan has already stopped the distribution of spinach, the vegetable kakina, and raw milk from these areas. Radiation shouldn't be a concern for American consumers, since only 4% of our food imports come from Japan. Even if you did eat contaminated foods for a year, they would only provide the same amount of radiation as a CT scan. Pass that on to the hysterical relative in your life.